So, on Friday, I begged you to go to the Dallas Art Fair. I hope you did. It certainly loomed large in our weekend. However, the Fair’s Opening Press Conference was actually Chapter Two. Chapter One played out on Wednesday evening. Come along and I’ll tell you all about it. The Dallas Art Fair just had its 11th event and somehow I was completely out of the loop for the first 10. I’ve been busy, but I thought I was paying better attention than that. However, I love me some Dallas and I take the drive over the I-30 Bridge quite frequently, usually headed down to the Dallas Arts District. My membership in the Dallas Museum of Art has never wavered. I keep my eye out for Nasher events. So, I’m not sure how I became so disconnected with an event like the Dallas Art Fair. While I may not be as plugged in as I used to be, as a regional blogger, some organizations do keep me in the loop. The DMA, the Perot, Preservation Dallas and the Arboretum all have me on speed dial, figuratively speaking. So, when I got an email from the Cultural Counsel inviting me to an artsy thing in the Design District, it wasn’t exactly a surprise. I checked my calendar and then invited the hubby along. As principals of a real estate photography company, we are always interested in new construction and new developments. We arrived at River Bend eager to find out exactly what was going on in this new addition to the Dallas Design District. At first glance it was comparable to other business/retail spaces all over the Metroplex. The invitation had mentioned “Late Night Gallery Openings, Clare Woods Book Signing, and SOLUNA Performance.” Galleries we understood, but the rest had to be discovered. The invitation had not mentioned comestibles at all, but a happy Art Fair associate greeted us and pointed us towards the serving lines. Gladly the choices were not limited to cheese cubes and bad chardonnay. Bill tried a local brewery offering from a series of kegs (I’m dieting again, so I was going to wait for the promised mineral water) and then we headed to the buffet line. Caterers were whipping out chicken and pork street tacos, shrimp tostadas and corn-on-the-cob. I loved it all, but that probably had a lot to do with the avocado crema. Bill wasn’t as crazy about the entrees. He doesn’t do avocado and I’m guessing the other offerings were a poor substitute, but he loved the corn. I’d recommend the caterers, but I never found out who they were. Next stop was a door with a large sign advertising Soluna, the musical portion of Dallas’s Art Month, sponsored by the Dallas Symphony Orchestra. I was there to get a bottle of Topo Chico Mineral Water. The space was devoted to the evening’s audio entertainment, an “Icelandic musician” with “signature trolls”. The music wafted out of the performance space and I could tell it was a little out there for me. Bill ducked his head in and his main complaint was the overuse of volume. Continuing down the way we visited a couple of gallery spaces. One only had a few pieces and the other seemed more actively devoted to the consumption of Modelo than the presentation of art. It was time to head back in the other direction and see what we could find. On our way back to the center of things, we focused on the ceramic murals of the exterior walls. A book signing by the murals’ artist was part of the evening’s offerings. Bill wasn’t fond of the mosaics, but I was more pleasantly effected by the thematic river vistas. Returning past the trolls, we happened upon some more gallery space and these spaces seemed to be more serious about the art portion of the event. Our final stop was the 214 space, which serves as a gallery and as the offices for the Dallas Art Fair. Well-fed and having consumed as much as we could understand concerning the art offerings, we headed home. The next morning, I’d learn more about what I’d been looking at. I would be the first to admit that my taste in art leans toward the figurative and peters out some time shortly after the Impressionists. I find many things to like about contemporary artists who continue the figurative and classical traditions in art, however I have not given up completely on the non-figurative and alternate genres. I’m still trying, even if I don’t find myself enchanted. So, I’m not a good person to critique the art we saw that evening. The people watching was spectacular. I was happy to observe jeans and yoga pants were not the dominating fashion statement. In fact, the gentlemen, rather than the ladies, were setting the bar. Socks were so last century for these guys and all the pants were tight and short. Winning the award for tightest and shortest were those who wore cuffed pedal pushers. I have no idea of the proper name for these short trousers. We ladies used to call them capri pants, back in the day. But trend-setting short pants weren’t all I noticed. The top halves of these guys were also trendy. Those with longer pants had a sort of khaki/safari vibe to them. My favorite item on the men was a white straw trilby with a florescent orange band. The women just did not measure up. They seemed more interested in volume than style, like a pair of harem pants in a loud plaid. Other versions of comfort were apparent. The crispest female fashion icon was a sweet young thing in black leather short shorts. Her long legs were shod in high-heeled platforms with an interesting collection of straps. Her other clothing and accessories were black and gold. Her hair was a slick black bob. Kudos to her for appearing to care whether anyone looked at her or not. The rest of the women certainly didn’t indicate whether they cared one way or the other. Wednesday, we’ll head back to Cancun, then Friday I’ll chat about the press conference. Come back to visit! I would apologize for failing to post last week, except that it is kind of part of the story. See, I’ve gotten to the part of our photography story where I tell you how Bill and I morphed into Spot On Images. These first two months of 2019 have been so busy for us professionally, that some of my personal pursuits fell to the wayside, including the Travel Talk blog. Today, I’m catching up. Like a tree with deep roots, Spot On Images grew out of fertile ground. When someone asks how Spot On Images got started, I’m tempted to ask which version they want to hear! Actually there is only one version, but it has several chapters. Spot On Images grew out of our real estate experiences in California. Back then, some brokerages still hadn’t embraced the online version of the MLS. They still had hard copy MLS books in their offices, but they were the dinosaurs. Some agents still didn’t know how to input their own listings, but I got it immediately. At first, we hired professional photographers to shoot our properties, but soon we figured out we had a secret weapon on our team. Bill could take better pictures than the pros. Combining his pictures with my prose was a winning ticket. While many agents settled for a single exterior shot and descriptions that read something like this: 3/2/2 in Grover Beach, partial ocean view, near elementary school; Bill and I were filling every empty slot in the photo carousel (About 11 pictures back then – It’s more like 35 now.) and writing mini-novels as descriptions – and it was working. The only problem was, neither of us really liked selling real estate. I was making a killing at it before the bubble, but it didn’t feel as if I was doing what I was made to do. Long story short, Bill went to Iraq to be an interpreter for the Army and I moved back to Dallas to be near my parents, who were facing health challenges. In Dallas, I went back to school and the career thing was put on the back burner. Spot On Images wasn’t even a possibility we had entertained at that point, but whenever we inventoried our skill sets, to see what we might turn into a business, the same things kept coming up: real estate, marketing, photography, writing, business consulting and the internet. We just couldn’t figure out how that was a business. Spot On Images also grew out of Bill’s love for photography and real estate. While somewhat related to the story above, this story begins when Bill was in his twenties and took an interest in photography. He took lessons, joined photography clubs, read magazines, bought equipment and all that other stuff photobuffs do. Though he pursued other things professionally, taking photos, learning about taking photos, taking video, learning about taking video and buying equipment was one of his primary preoccupations, along with real estate and making money. Fast forward to a few years ago. A friend of ours in the real estate photography business decides to move closer to family for health reasons. Bill offers to buy the friend’s business, but instead the friend chooses to supplement Bill’s already impressive photography skills with some specific training in the real estate photography business, for free. Bill buys new photography equipment better suited to real estate and spends several months developing his particular style of real estate photography. He also buys a drone and gets his commercial drone pilot license. Along the way, he convinces Jane to quit doing marketing, social media and blogging for someone else and put it to work for the family business. Of course, neither of those versions cancels out the possibility of the other and there is still another version, which might also have some truth to it. A neighbor claims Bill was in a conversation where her husband was trying to convince another guy to start a real estate photography business. Bill says he doesn’t remember being in that conversation, but who knows, maybe he just forgot and it influenced him to offer to buy our friend’s business. Whatever the case, when Spot On Images started, it was mostly Bill’s thing. I helped with the website and did some cold-calling for him, but I had other fish to fry. Then suddenly he got so busy that he needed me to start processing the photos for him and I supplemented our cold calling by attending MLS meetings. I kept taking on Spot On Images responsibilities and one day I woke up and realized I was working full-time for Spot On Images. I put in more hours than our photographer does. How did that happen? Now Spot On Images is an us thing. Bill does his things and I do my things. We’ve got great synergy and amazing clients which make work seem more like fun. And our skill sets, real estate, marketing, photography, writing, business consulting and the internet – well somehow all of those things play an important role in the work we do for our clients on both the photography side and the marketing side. So that’s how I got from taking photos with an Instamatic camera and putting the snapshots into adhesive photo albums to being co-owner of a photography and marketing business. The roads I take never seem to be straight ones, but I seem to like where I end up. More and more of my work seems to be on social media and it’s a demanding medium, eating up posts almost as fast as I can create them. So, as has happened in other seasons, I may be a little unreliable over here on my personal travel blog. For at least for a little while, you can continue to enjoy my trip to Cancun and Chichen Itza, because I have Wednesday posts written through May for that adventure. And as usual, things will settle down and I’ll find a way to keep the blog going. so don’t you go anywhere. Travel talk will continue! OK, I admit it. When it comes to technology, I’m resistant to change. My husband would tell you I am inflexible – period – but I tend to be more generous with myself. I actually love new things and changes of scenery, but I want you to leave my technology alone. Usually, the “improvements” and updates to my technology just deliver more woes than solutions. You know what I’m talking about and you know I’m right! Vision has been one of my problems since 4th grade. Before school began I was 20/20. Before the school year was over, I’d been sent home with a note. This child cannot see! Get her some glasses. My life has never been the same! My first glasses were the ugliest pair of cat-eye frames you’ve ever seen and my parents made me wear them until I was 16! Finally, I got contacts. They made it easier for me to see, but what a hassle. If I thought that was bad, Mother Nature had another surprise for me as I aged. My eyes got too dry to tolerate contacts, so I had to go back to glasses. My pink cat-eye wire frames were a lot cuter than my original glasses, but I began a series of losing and breaking glasses that keeps me in hot water until today. Lasix gave me a brief respite from glasses, but while my long range vision is still decent, I soon required glasses for reading. When I gave up my flip-phone, the vision problem came into play. I could read my flip phone fine without my glasses, which vanity demanded I go without as often as possible. That darned smart phone keypad was my Waterloo. To answer my flip phone, all I had to do was open it. The smart phone wasn’t that smart. I had to squint my eyes and find the right icon to answer. In fact, I had to squint my eyes for everything. While the rest of the world was loving all the smart things a smartphone could do, I mainly used it as a phone. I couldn’t see anything else. Besides, the picture quality, while better wasn’t all that great. What’s more, it had that viewfinder screen and I’m still partial to the other kind. I was in limbo. I wasn’t in love with my smartphone – primarily because I couldn’t see. My Fingers Won’t Do This! I had another challenge when it came to smartphones. I not only had a hard time seeing it, my fingers were too fat for it. I abhorred texting with the darned thing, because typing was an exercise in frustration. My fingers just could not hit the right letter. To boot, I have arthritis in my thumbs. All those Millennials who look so cute speed typing with their thumbs? I’d like to see them thumb-type with mine. They’d have a Go-Fund-Me page for the cure of arthritis in a New York minute. Nothing Smart About a Smartphone To Me! My first brush with smartphones did not loosen my grip on my DSLR camera one bit and you’re not going to find any pictures from it in my scrapbooks. All that was about to change. I just didn’t realize it yet. Come back next week and see what turned me into a smartphone addict. So, after losing all the digital pictures we took on our cruise to the Yucatan, I was pretty disgusted with digital photography. However, 35mm film was becoming harder to find and more expensive when we found it. We stayed in photography limbo for awhile, but then we found the inspiration to embrace DSLR. In 2012 we planned a trip to the Pacific Northwest and we knew one thing: we were going to need a new camera. I had two requirements. The new digital camera had to have a traditional viewfinder and I wanted it to be fast. If you’re wondering why we didn’t just use our phones, then you’ve forgotten that in 2012 most of the world was still using flip-phones. While the flip phones took pictures, they didn’t take good pictures. We bit the bullet and spent more money than we’d ever spent on a camera, but oh what a camera we found. Before Bill bought the DSLR, he insisted that I attend photography classes with him on how to properly use the new camera. Since the new one had a viewfinder and I could click one photo after another, without having to wait, a few photography classes seemed like a small sacrifice. Suddenly, we were in digital photography heaven. Even before the trip, Bill and I would go on photo safaris around town. Photography was no longer a touchy subject where Bill resented the cost of film and I refused to use a digital camera. Our time in Oregon was a photographer’s dream. Bill took hundreds and hundreds of pictures. The resulting scrapbook album was inches and inches wide. After the Oregon trip we became photography fanatics. It seemed as if every trip we got better at it. We took cruises in the Caribbean and on the Danube. We visited glorious gardens in California. During this photographic period we also went to Egypt for a family wedding. Oh what amazing, beautiful images we captured on these trips. While we were wallowing in this photographic bliss, something else was going on. Suddenly, phones had great cameras in them and the world was taking pictures of things they’d never noticed before. Remember how odd it was the first time you saw someone take a picture of their food in a restaurant. I remember looking at them like they were crazy. Now I do it, too. We all do it. I will confess that it was with great reluctance that I gave up my flip phone. We’d found me an industrial strength flip phone that didn’t mind falling and the new phones had huge screens that seemed to crack when you looked at them. As with many technical innovations, I ran into some difficulties. The first problem was not my fault. Bill proudly presented me an LG smartphone that wasn’t all that smart. It didn’t ring. We still don’t know why and the problem wasn’t on any of the customer service scripts. Their computers told them it was ringing, but it wasn’t. He’d ordered it online, but we had to go to a big box store to prove to them that it was, in fact, not ringing – regardless of what the computer said. I moved on to Samsung. If it had rung, the LG would have been great, but it didn’t and in spite of what other marvelous features it had, one thing a phone needs to do is ring. So, how did I do in photography with my new Samsung. Well, come back next week and I’ll tell you about it. In many cultures throughout history, women entered into the contract of marriage with a dowry. Bill wasn’t quite that lucky. All he got when we married was a stack of photo albums, clothes to clutter his closet and a bunch of other things which didn’t exactly improve his net worth. He convinced me to get rid of some of my property in a garage sale. It didn’t do much for his bottom line, but he did regain a little of his space. One thing he couldn’t convince me to get rid of was my photo albums. I’ll admit it. My collection of mismatched photo albums was down right ugly. Some had their spiral rings showing. Others had hideous covers. And yes, most of the photos were mediocre at best, but they held my memories, so they weren’t going anywhere. Then a couple of things sort of happened at once. I met a girl at work who was a Creative Memories Consultant and I signed up for a scrapbooking class at church. I found out that while I’d been smart to collect memorabilia and include it with photos in my albums, I learned I’d been doing pretty much everything else wrong. I don’t recall who sold me my first album and stickers, but that day, a scrapbooking legend was born – and she was me! What had inspired me to sign up for the scrapbooking class was a cruise I was about to take. With one CM Consultant teaching me to scrapbook at church and another one giving me delicious catalogs at work, my days of sticking photos into adhesive albums were over. I completed the first album in no time flat and then the girl at work invited me to bag up all my loose photos and let her help me sort them. OK, I sort of get into organizing. I’m not crazy about cleaning, but I will organize a messy desk drawer at the drop of a hat. I actually stand in stores and neaten their displays. I will be in the line at Fry’s and suddenly I’m sorting out their candy display and putting things back into a semblance of order. Clothing is a particular favorite of mine – sleeve length, color, neckline, solid or pattern. One minute I’m shopping for a blouse and in a few moments I organizing the rounder. Drives my poor husband crazy. The minute organizing was tied to scrapbooking the hook was set. Not only were Creative Memory albums more attractive than the other albums, they preserved the pictures and memorabilia put into them and, most important for me, they were a great way to organize my pictures. If I was scrapbooking along and discovered a cache of pictures that belonged in an album I had already finished, no problem, I could add pages into the completed album wherever I wanted to. I could also keep on adding pictures to an album long after one of those adhesive albums would have been filled. My first album is about an inch and a half wide. The last one I finished was more like five and a half. I made my first CM scrapbook in 1998. Twenty years later, I’m still scrapping. From my office chair I can count over 40 albums in my bookshelf That doesn’t include all those I have done and given to other people or those in a closet I will not name. Those 40 some odd are just my favorites! But it’s time to go for today, so let’s pick up here next week! Bill and his camera at Stone Mountain. I took it with my disposable! I rarely run short of reasons to be glad I married Bill. I may, at the same time, be so mad at him I can barely breathe, but the mad times come less frequently as we near our 25th wedding anniversary and when they do, they are short-lived. He really is a wonderful man and he’s so darned handsome. He’s also an amazing photographer, just ask any Spot On Images customer. By the time I met Bill, the Instamatic’s days were over and done with. The digital camera was breaking into the market, but they were pretty expensive, so this working girl couldn’t afford one. Most people were using some form of a 35mm, but not me. I had a hard time finding film for my Instamatic, but I had discovered the disposable camera and that worked well enough for me. Enter Bill with his fancy Canon Rebel. By then he was already pretty darned good at photography. He’d had some lessons and was fairly serious about the medium. My disposable cameras probably made him a little crazy, but he was trying to romance me, so he left me to my point and shoot bliss. Well he almost left me alone. He gently began to introduce me to 35mm. Not only did he think disposable cameras were a waste of money, he rightly pointed out the poor quality of the results and coerced me into giving his camera a try. I guess here’s as good a place as any to admit he not only introduced me to 35mm photography, he also made me learn how to use a mouse and had me sign up for my first personal email address. In other words, he brought me into the 20th Century, which was already on it’s way out. His first attempts at turning me into a real photographer were not so good. He was all about F-stops and exposure. All he could get me to do was use the Auto Button. Twenty-five years later, I’m still all about the Auto Button, but I do appreciate what he is able to do with a camera. About this time he also decided to get a camcorder. Video cameras were this huge thing you had to carry around on your shoulder and there was no sound. Over time the cameras shrank and they figured out how to include sound. Bill entered the market when Hi8 was all the rage. If he had thought it was tough getting me to use a 35mm still camera, he quickly realized that was nothing compared to getting me to hold the camcorder. That sneaky guy bought the camcorder into time capture his proposal – quite a treasure. His plan was to get me up to speed on the 35mm, so he could be the videographer. What happened was he ended up being the primary cameraman, regardless of the media, and I filled in when he forced me to. Thanks to him we have a marvelous record of our early years together – yeah Mr. Bill! There’s more to tell you about our photographic history together, so come on back next week! While digital photography is here to stay, there are reasons I remember analog fondly. Last week, though I moaned about the quality of analog snapshots, I found a number of reasons for enjoying photography the old fashioned way. Whether you think taking pictures in analog was a blessing or a curse, let’s move on to the next part of the equation, getting the pictures developed. Analog film came in different lengths. A roll or cartridge of film could have anywhere from 12 to 36 shots on it. When traveling, I always bought the 36 shot length, but when I was around home I switched to 12, so I could finish up the roll faster. During some periods of my life, I was so boring it could take years to finish up 12 pictures. One thing is for sure, you’d never just go ahead and develop an unfinished roll of film. That would have been some kind of sacrilege. Some people mailed off their rolls of film. They’d boast of saving money or assure me that was the way to get the best quality processing, but that just didn’t work for me. I didn’t want to keep up with where to send them or store a stack of their envelopes or pay the postage, especially when I could drop them off around the corner and then go back by and pick them up later. Used to be “later” was later than it is now. One-hour photo processing has been the norm for so long, that most of us don’t remember a time when it wasn’t, but yes, you used to have to wait days to get back the photos you dropped off. They were probably sending my photos to the same place they would have gone to had I been able to wrap my mind around mailing them, but whatever the case, an hour or a week, the anticipation was part of the fun. When you casually check out your phone to see the picture you just took, you can’t begin to imagine how much fun it was to wait. I’ve already said not being able to immediately see the photos took some of the anxiety out of it. Instead of anxiety, you had anticipation and lots of it. You had to get home from vacation and unpack your bags. Then you had to find time to drop off the film and time to go pick it up. Then you got the envelope with your photos. There was a time when I couldn’t even wait to get out to my car to look. I’d rip open the envelopes the second I got them and started looking at the pictures. I’d go through the pictures two or three times before I could stand to put them away and go on with my business. Many places would give you a refund for any picture you didn’t like, but it was only a few cents per picture and I thought even my worst picture was worth an ounce of gold. Having to wait to see your pictures might seem like an inconvenience to many, but it was really just part of the fun. Come back next week and we’ll share another stroll down the photographic memory lane. My parents gave me my first camera, a Kodak Instamatic, for my 16th birthday. Until then, I’d never been on the business end of a camera and I have the pictures to prove it. None of them were selfies though, because if you’d have taken a picture at arm’s length, all you have gotten was your nose. 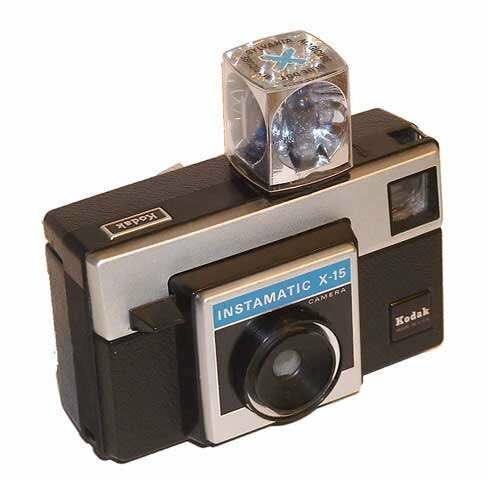 The Kodak Instamatic had a real innovation, the flash cube. Up until then most amateurs made do with an old fashioned flash attachment, which used a single-use flash bulb. So a flashcube which attached directly to the camera and was good for four photos was a great innovation. Eventually, you could buy a flash bar with even more bulbs, but that was later. The flash, cube, bar or bulb was quite irritating. It made a loud pop and then a bright white light would blind everyone in your picture, leaving them with spots hampering their vision. That’s the reason why so many people in old pictures have their eyes closed. As soon as the flash went off the shutter opened, but not before most of us closed our eyes. You might think with all that noise and brightness, the flashes would light up the pictures, but you’d be wrong. In the finished photo, the items closest to the camera were too bright and behind that it was all darkness. The results were pretty pitiful – usually a bunch of over-exposed faces with their eyes closed. Combined with the expense of the film, it really didn’t make a lot of sense to take pictures when a flash was required, so most of us didn’t. I’ll just say it. My Instamatic photos weren’t all that great, but then again, neither were anyone else’s. Oh, there were serious photographers using 35mm cameras, but they weren’t the norm. A lot of folks were so dissatisfied with the whole snapshot thing they had their photos developed into slides. Perhaps you have a grandfather or great-grandfather who turned off the lights and bored you to death with their slides. The processing quality was better, but there were also a lot of bad slides, because your average guy was a pretty bad photographer. My Instamatic was my only camera for years, but I really only pulled it out when I traveled alone and that was usually for church trips. The rest of the time my dad was in charge of family photography. For years he used a Brownie Hawkeye, which was actually a pretty good camera. Then he moved into Polaroid, which was definitely a step in the wrong direction. I guess I’m telling you all of this as a form of apology for all the bad pictures I took, but they didn’t bother me, because everyone else’s pictures were almost as bad as mine. The mediocrity of the pictures actually added to the fun of photography. Few of us really bothered with setting up a shot properly. You just whipped your camera up to your face and snapped. Sometimes you would get lucky. Sometimes you wouldn’t. Lucky or not, at the time the picture was taken, you took it and forgot it, because you wouldn’t see it until you developed the film. There was no stopping the action to oooh and aaah or moan and groan. You didn’t have to share it on Instagram, Facebook or Twitter. You didn’t have to text it to anyone. What you did have to do was carry film with you and a few flashes, just in case. This was perhaps the worst part of analog photography. You could almost guarantee that should a really unique photo opportunity arise, you would usually miss it, because you just ran out of film. Now all you have to do is be sure your phone is charged. Well, I have run out of words for today, so we’ll move on to the introduction of 35mm to my life. Come back next week and we’ll chat some more about the good old days before digital photography. I’ve just finished up a season of scrapbooking. I was way behind and am almost all caught up. As my scrapbooking shelves fill up with my latest creations, I couldn’t help but think about the way things used to be. Before there were photo albums, there were scrapbooks. The earliest scrapbooks were actually just books that did second duty for memorabilia. Someone would press a flower into a book or lodge a letter in between the pages and often that book was the Bible. Or people would keep journals and insert various drawings or keepsakes among the pages. The earliest official scrapbooks seem to date back to the late 1700’s and the hobby is still popular today. Photography had a huge effect on scrapbooking. When cameras first became available to the general public, photographs had great value. Many people with a camera would do their own photo processing, turning a spot in their home into a photo lab. Cameras were expensive, film was expensive and processing was expensive, so the results had gravitas. People understood the fragile nature of photographs and they liked to share their work with others. Those were the days of leather photo albums with black pages and little black photo corners that had to be stuck down with rubber cement. If your family had any of those, hold on to them. Great effort was made to use the proper materials for preserving the photographs. Improvements were made to photography, which was both a good thing and a bad one. Cameras, film and processing all got more affordable. With more snapshots being made and shared, the photos didn’t seem quite so valuable. People would just toss them in a drawer or a shoe box. I recall wonderful times with my family, because of these drawers and shoe boxes. The conversation would come around to some long dead relative and then someone would say, “I think I have a picture of them.” I can’t tell you how happy that would make me. Black and white photos would be spilled out on a table or the floor. The next few minutes or hours are among my favorite childhood memories. When I started high school, my mom invested in a large scrapbook for me and I dutifully documented the high points of my year. The book was filled primarily with memorabilia. Photography was in the Polaroid stage and photos, quite frankly, were awful. It was great fun to take the pictures and show them around, but like the snapshots from your Instamatic camera they didn’t seem as valuable as those early photographs processed in someone’s dark room. Then came the adhesive photo album. Oh my! How many dozens of those did you buy? The adhesive albums were cheap, they were easy and they were a lot better than tossing the photos in a drawer. At least, that’s the way it seemed in the beginning. Most people used the sticky-paged albums exclusively for photos, but I was always a scrapbooker – even when I didn’t know exactly what that was. I’d intermingle my memorabilia among my photos and often write out narratives to be included in the pages. A company called Creative Memories set out to change the face of scrapbooking. Plenty of people were still throwing photos in a drawer, but there were also people like me who had stacks of adhesive photo albums which were slowly ruining my photographs and memorabilia. When I was introduced to Creative Memories I felt as if someone had come up with these wonderful products for me personally. My next thought was that everyone in the world should be getting their valuable images and memorabilia into a photo-safe album. It is no wonder that I became a consultant for Creative Memories. That’s not the end of the story though, so come back next week and we’ll continue to talk about the evolution of photography and scrapbooking.